How to Get It, How to Keep It, How to Get It Back if You Lose It! Overall I must say that I was disappointed with this book as it didn’t seem to excite me, spark any new ideas or even capture my attention well with ways to build what the author’s topic is all about, your mojo. You mojo is described that inner spirit or drive we have to do what we do best starting from the inside and expressing that outward. I think this is because I actually really love the concept of mojo and internal motivation that drives us to excel, unfortunately, this book just didn’t draw me in at all to that. It is however, still a good book that outlines many of the important factors that are necessary to build mojo and maintain it so for someone without an already high level of inner drive, I think the book would be far more useful. This was the first of Goldsmith’s books I’ve read using audio version and Goldsmith read this one for the recording himself, which personally I felt was a disaster. His tone and continuous pausing and repetitive upward tones at the end of every single sentence was incredibly distracting and it would never listen to another book he’s read directly because of this. His reading style kills the flow completely for me and his repetitive pitch change never seems to match the content he is ready, so I found it was actually quite hard to listen to, and that is very rare for me since I mostly listen to audio books and love them since I’m an audible learner! I found this useful yet at the same time, rather simplified and I was not convinced of how it was actually useful through application, it was simply information and I never connected with the point of it. There is a useful mojo scorecard and tips throughout to examine your activities and to measure the level of mojo you experience. It can certainly help to draw you to discover what activities affect your mojo so is quite useful. More insight is given through a series of stories and questions that Marshall uses to explore your mojo further. I thought these were a bit disconnected and not really supporting what I was hoping to get from the book as far as experiencing mojo and putting it to work for you more often. There were many tips but I never got the sense that I really had a clear idea since even Marshall says repeatedly that mojo is all internal and has to come from within. After hearing that a number of times, I wonder why he wrote the book then? Also, there are lots of good pieces of information and stories about mojo and many tips on how to discover it. 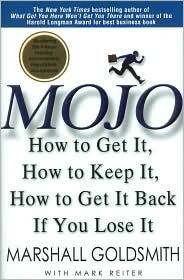 There is an excellent section on maintaining your mojo and being consistent with yourself and others to ensure nothing prevents your mojo and he explores 10 reason you can quickly lose your mojo which are particularly useful to avoid. He covers through repeated example a concept of ‘change it’ or ‘change you’ which is really saying that you must decide to change something about your situation to move towards more mojo or you have to change yourself to have different motivators or expectations. And finally in the book, mojo is explored by using a technique of framing it and naming it. If you recognize bad habits that kill mojo and give them a name to remind you of that, you can use that name yourself or teach others to use that name to help point that behavior out when it occurs and snap you out of a situation killing mojo. This is a useful tip and I have always liked the idea of framing associations around behaviors and actions so this one is particularly useful to me. So overall, this is a decent book and explores many areas of mojo, that anyone who is interested in a lot of self analysis and reflection can benefit from. I had a number of reason listed above why I rated this lower. I’d definitely recommend the printed version over the narrated one by Marshall himself and if you haven’t read his other book, ‘What Got You Here, Won’t Get You There‘ I would definitely say you should start with it, as it is a better book all around and similarly helps you to assess yourself and discover your limiting actions prevent your best work. I found this a rather dry read as well. I checked it out and read the first couple chapters then decided against it. I have pretty good mojo and karma to boot. I have found if you are a good person then good things will happen. Mike, Your take on this book was interesting. I thoroughly enjoyed Mojo. I have his other book on my list but I haven’t bought it yet. I definitely plan on checking it out. I can’t get that much out of audio books. For whatever reason I extract a lot more from reading the printed versions. @sell textbook. Hmm, well I’m glad I’m not the only one who thought so. @Stephen. Well, believe me I really really wanted to LOVE this book as I love Goldsmith’s work and writing usually, just didn’t get much out of this. I will say that I have a pretty high mojo as it is and many of the things that I use for my mojo either weren’t in the book which surprised me and some of the items listed I don’t think would be useful for me to use. Overall, there are lots of good tips, my rating this time is largely a personal preference I think and partly affected by the audio version. Anyway, glad you enjoyed it, it is a good solid book, and you will surely enjoy his other hit. It’s excellent (and I read that one BTW). As for audio, I listen to 70% of the books I go through and that is because I’m a bicycle commuter and an audible learner so it fits my learning style and lifestyle perfectly. I also have extremely high comprehension from content I hear so I learn easier that way than reading. I’m changing the Ancor Text for the link to our website, if that is Ok with you? Insofar as this book is concerned I have reservations about narrated works, unless professionally done and produced, as it robs you of so much. No wonder the book has no mojo itself. It seems like a bit of a soulless work, where the true seeker is not really going to get much gospel. Thank you for the honest review!